faq Archives - Golden Construction Services, Inc.
Are you getting tired of your old appliances and the outdated look of your kitchen? Is 2018 the year that you are ready to make a change? Why don’t you start with a great kitchen remodel? There are many advantages to remodeling your kitchen. It is a time-consuming process however the results are worth it. 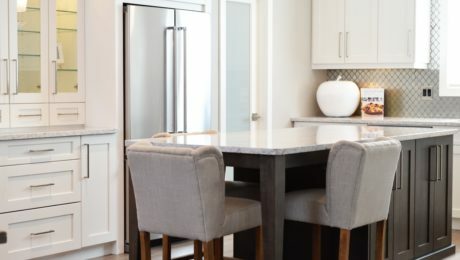 Before you start your project, keep these 6 steps in mind and your kitchen remodel will run smoothly. Before you get into remodeling think about certain factors such as durability, efficiency, and current trends. The size of your kitchen doesn’t matter quite as much as formulating a plan before you start renovations. In a kitchen, it is all about functionality. Determine the things that you must have in your new kitchen from storage to types of countertops and appliances. You may think you have got it all covered but a professional kitchen designer can help you make the most of your space. An experienced designer will be able to give you ideas that you may not have thought about before for your kitchen project. Sure, many contractors have built or remodeled plenty of kitchens, but they are usually following a print. Hire a contractor with a designer or one they recommend. Determine a budget prior to starting the job. This will help you choose materials and items along the way. Make sure that you don’t compromise on the quality of work. Sticking to a budget can be difficult but it is necessary to avoid monetary headaches later. Working with your contractor will help you determine if your budget is not only feasible but reasonable. The basis of your kitchen is the countertops and cabinets. This is what you will use the most. Be sure you look at all your options of materials and choose one that you will be able to enjoy for years to come. Think of wear and tear as well as function. Certain materials may be a better fit for how you and your family use the kitchen and how often. There are multiple options for appliances and all budget types. There are also a variety of finishes including stainless steel and even refrigerator/dishwasher panels that can conceal them behind the cabinet door. Focus on the features that you must have to help you narrow down your choices. Your kitchen will have a lot of heavy traffic. Make sure you pick a floor that is highly durable with low maintenance. Talk to your designer and contractor regarding certain types of tile or wood that work best for most types of kitchens. When it comes time to plan your kitchen remodel call the experts at Golden Construction. Our years of remodeling and construction expertise will help you get the kitchen of your dreams. We are presently serving the greater Tampa Bay area, which includes Pinellas, Hillsborough and Pasco counties.